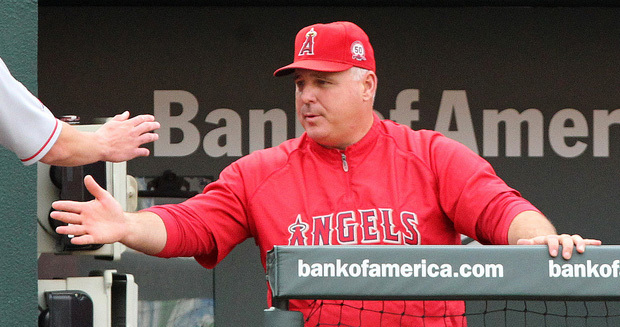 MIKE SCIOSCIA will step down as Angels’ manager, the Los Angeles Times is reporting (Flickr/Keith Allison photo). On the last day of the season, the Los Angeles Angels of the Anaheim posted their final victory of 2018 and are poised to end an era in team history. On Sunday afternoon in the Big A, the Halos rallied for three runs in the bottom of the ninth inning to get a 5-4 win over the Oakland Athletics. That gave the Angels five wins in sixth games, a closing kick that carried them to 80-82, an almost break-even season. Taylor Ward’s two-run walkout homer was shortly followed by the report from the Los Angeles Times that longtime manager Mike Scioscia was hanging up his spikes after 19 seasons as field general. A formal announcement has not been made by the team, but if the Times report is accurate, the Angels are saying goodbye to the only man who ever steered them to a league pennant or World Series title, both in 2002 when the team was known as the Anaheim Angels. Scioscia, 59, guided the team to six American League West division titles, and ranks 18th among all major league managers with 1,650 wins (against 1,428 losses).